When an emergency strikes at home and every second counts, fast, reliable communication is essential. It’s why every Alarm.com-powered security system includes professional security monitoring and a dedicated cellular connection. 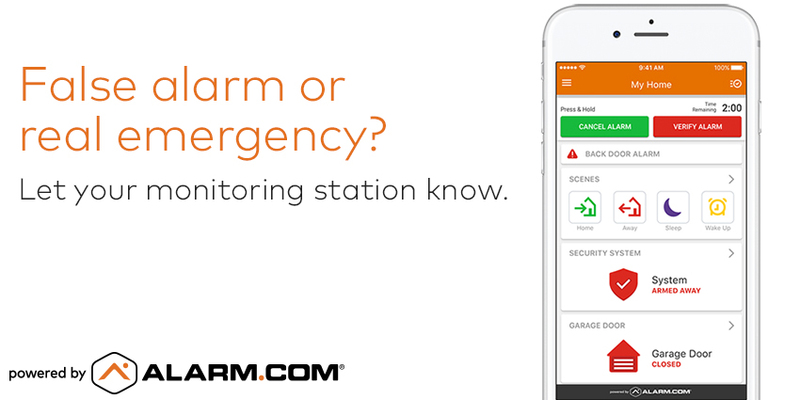 Now, we’ve released Smart Signal, a new type of emergency protection from Alarm.com. Smart Signal gives you a direct connection to your home’s monitoring station from anywhere, using only your Alarm.com app. When we launched the feature at CES2019, the Consumer Technology Association named Smart Signal their 2019 Security Product of the Year. Smart Signal enhances your home’s professional monitoring with a set of clear, simple emergency buttons in your Alarm.com app. These buttons let you quickly verify an alarm at your property to expedite emergency response, cancel a false alarm easily, or send a panic signal from your home or business if you discover an emergency yourself. Because it’s in your smartphone app, you don’t have to be at your property to use Smart Signal. You can respond to an alarm from anywhere, using your app to check video feeds and images before verifying or cancelling. Streamlined, efficient and effective, Smart Signal reinforces your control, your safety and your peace of mind. Smart Signal extends professionally monitored security into your mobile app to give you streamlined control and enhanced protection. You can rest assured knowing that a verified alarm can help expedite your monitoring station’s response to emergencies, and that you can trigger a panic signal for help at home in a broad range of emergencies. False alarms are a common concern. Many local ordinances even impose fines for false alarm dispatches. Smart Signal lets you easily and securely cancel a false alarm with a single command, with no need to talk or remember a passcode. Just hold the Cancel button in your app to let your monitoring station know that no further action is needed. Alarm events and emergencies are stressful. We designed Smart Signal to be accessible and easy when you need it, while also safeguarding against accidental responses. For this reason, , Smart Signal’s Cancel and Verify buttons only appear in alarm events. To confirm or verify the alarm, all you’ll need to do is hold the relevant button for three seconds. Want smarter emergency safeguards for your home? For best-in-class protection with proactive safeguards and easy mobile controls, choose smart home security powered by Alarm.com. Delivered by professional service providers, it’s the easy and reliable way to keep your family protected.